The property/casualty (P/C) insurance industry had a comparatively strong first quarter in 2018. Premium flows, underwriting gains and profitability measures were all higher than most first quarters in the previous decade. 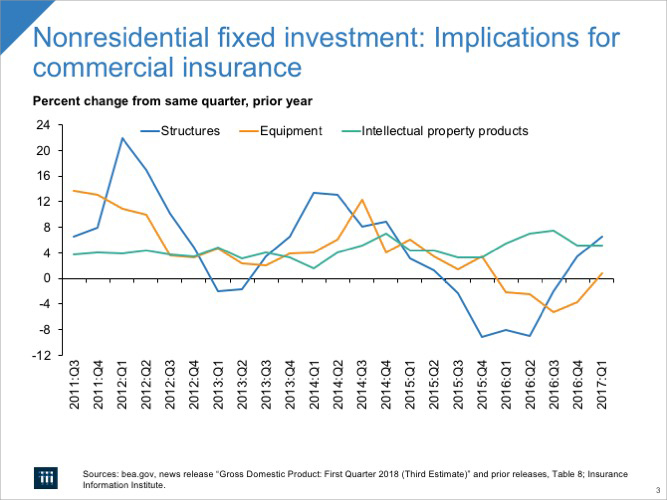 For the property/casualty (P/C) insurance industry in the first quarter of 2018, the financial weather report was bright, compared with the first quarters of the prior decade. Net income after taxes was just behind 2013:Q1 and 2015:Q1—and more than double the 2017:Q1 result (Figure 1). Profitability, as measured by return on average surplus, was 9.1 percent (vs. 4.5 percent in the first quarter of 2017). Also, the combined ratio improved dramatically (to 94.6 from 99.5 in 2017:Q1), riding a $4.2 billion underwriting gain (vs. a $0.6 billion underwriting loss in 2017:Q1). Net written premium growth was 15.7 percent (vs. 4.0 percent for the first quarter of 2017). The industry results were released by ISO, a Verisk Analytics company, and the Property Casualty Insurers Association of America (PCI). A discussion of the key drivers of the quarter’s performance follows. P/C insurers measure premium income in three ways, each of which gives a different insight into the industry’s activity. Direct premiums are amounts that policyholders pay. This is a basic gauge of “retail” activity. Net written premiums are calculated by subtracting amounts insurers pay for reinsurance from direct premiums, and are therefore a simple gauge of the net amount of risk that insurers planned to assume. Net earned premiums are derived by adjusting net written premiums to reflect the insurance that was actually provided. Direct and net written premiums are forward-looking measures, while net earned premiums are a backward-looking concept. ISO estimates that direct premiums rose by 6.0 percent in the first quarter of 2018 vs. 2017:Q1. This is a strong result. It is a larger increase than in any first quarter in the prior decade, and likely larger than any year since the hard market in 2002-2003. The spurt in 2018:Q1 was likely led by auto insurance premiums, which have risen in part to pay for higher frequency and severity of claims than had been previously anticipated. For comparison, in recent years all-lines first-quarter direct premiums generally rose by 5.0 percent at most, and often by less. In contrast, net written premium volume in the first quarter of 2018, at $156.6 billion, grew by 15.7 percent over net written premium volume in the first quarter of 2017. As noted above, net written premiums adjust direct premiums for reinsurance ceded and assumed. In this case, the amount of reinsurance assumed by U.S. insurers in 2018:Q1 was much greater than in 2017:Q1, thanks to U.S. insurers’ responses to the Base Erosion and Anti-Abuse ( BEAT) provisions in the Tax Cuts and Jobs Act. That tax is designed to discourage the movement of profits outside of the United States. BEAT provisions would likely apply to companies that cede reinsurance to offshore affiliates. Beginning in 2018, such premiums may be subject to the tax. Instead of placing reinsurance with offshore carriers, insurers placed it with U.S. carriers instead. So, starting from a 6.0 percent rise in direct premiums, the larger reinsurance element meant that net written premiums rose at an even higher pace. This was the 32nd consecutive quarter of all-lines-combined year-over-year net written premium growth—a streak that began in the second quarter of 2010, when the economy was barely beginning its recovery from the Great Recession. Net earned premiums, at $143.1 billion for 2018:Q1, rose at a 9.4 percent pace, more than double the growth rate of 3.5 percent in the first quarter of 2017. There are two main drivers of premium growth in the P/C insurance industry: exposure growth and rate. Exposure growth—which is an increase in the number and/or value of insurable interests (such as property and liability risks)—is driven mainly by economic growth and development. A summary statistic that corresponds to exposure growth is the nominal U.S. GDP. Nominal GDP in the U.S. has—especially since mid-2010—been roughly 4 percent at an annual rate, which correlates with the changes in P/C industry direct premiums (Figure 2). On this basis, the outlook for premium growth is fairly bright. For the full-year 2018, most forecasts currently see nominal GDP growth ranging between 4.7 percent and 5.3 percent, and for the full-year 2019, nominal GDP growth is forecast to be between 4.2 percent and 5.4 percent. The industry benefited from exposure growth in some pockets of the economy. For example, in the first quarter of 2018, investment in business nonresidential fixed investment (consisting of structures, equipment, and intellectual property (mainly software) was 8.1 percent higher than in the first quarter of 2017 (Figure 3). Note that investment in this category had been negative for all of 2015-2016. Remarkably, the labor market continued improving: The U.S. economy added about 655,000 private sector jobs in the first quarter of 2018 (seasonally adjusted), compared to about 532,000 in the same quarter a year earlier. This job growth is somewhat surprising because, with a “headline unemployment” rate around 4.1 percent during the quarter, some economists judged that we had reached “full employment.” The Institute of Supply Management’s Manufacturing index showed expansion throughout the quarter, and its Non-Manufacturing index was even stronger. With more people working and with wages rising, payrolls are expected to continue growing, resulting in rising new premiums written by workers compensation insurers in 2018. 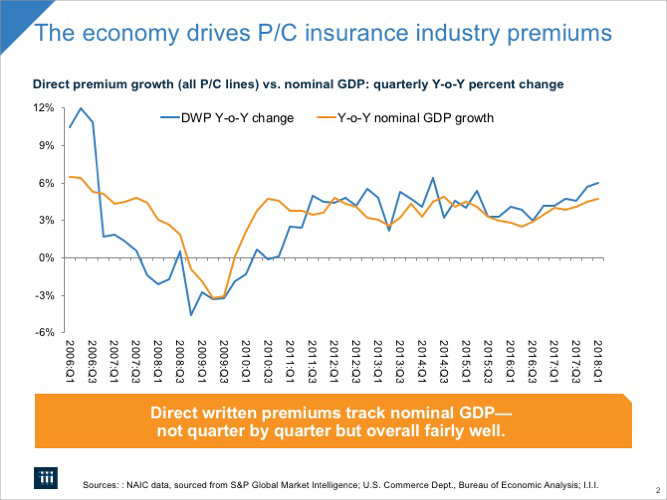 The other important determinant in industry premium growth is rate activity. Rates tend to be driven by trends in claims costs, conditions in the reinsurance market, marketing and distribution costs, and productivity improvement from investments in technology, among other factors. Measures of rate activity tend to be anecdotal and vary among lines of business. However, as a general statement, most rate reports suggest that rates have been nearly flat for most commercial lines, reflecting combined ratios under 100. Although it is challenging to foresee the interplay of all of these elements as well as macroeconomic factors, it is certainly possible that overall industry growth in direct premiums written could keep pace with, or surpass, overall U.S. economic growth in 2018. Net written premium growth for the major subsectors of the industry moved in the same direction, but to different degrees. For insurers writing predominantly personal lines, premiums rose by 8.2 percentage points (vs. a growth rate of 5.7 percent in the same quarter, prior year). For those writing mainly commercial lines (excluding mortgage and financial guaranty insurers), premiums spiked by 34.7 percentage points (vs. 2.5 percent growth in 2017:Q1). And those writing balanced books of business posted net written premium growth 4.8 percent higher than the year-earlier quarter. Overall insurance operations performance (that is, excluding investment performance) is the difference between net earned premiums and the sum of incurred losses, expenses and dividends to policyholders. The first quarter of 2018 produced a net underwriting gain of $4.2 billion on net earned premiums of $143.1 billion. This means that five out of the last six years registered first quarter underwriting gains; however, this string followed four years of equally large first quarter underwriting losses (Figure 4). There are two main drivers of underwriting performance: losses and loss-adjustment expenses, and other expenses (for marketing, underwriting and general administration). Losses and loss adjustment expenses grew by $2.8 billion (+3.0 percent) to $96.2 billion—unusually, half as fast as premium growth. 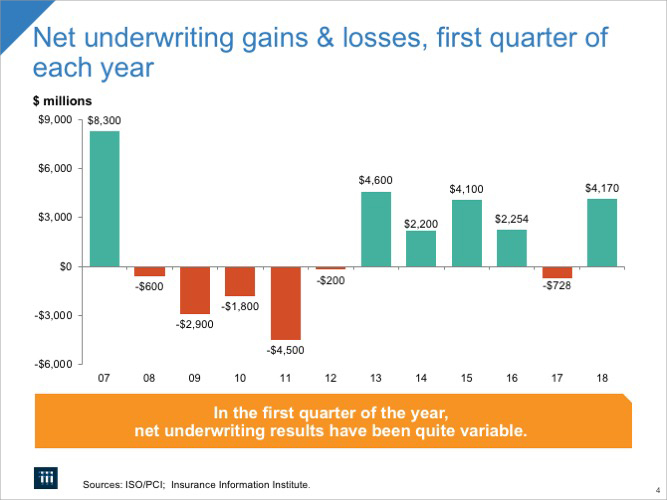 Underwriting performance in the first quarter of 2018 benefitted from catastrophe losses that were not as bad as in 2017:Q1. The first quarter is not normally a high-catastrophe-loss period, and the 2018:Q1 result—$5.0 billion—was lower than the 2017:Q1 number—$7.7 billion. ISO/PCI commented last year that, except for the Northridge earthquake claims in 1994:Q1, for the prior 68 years (that is, from 1950 through 2017), the only other time that catastrophe losses topped $4 billion in the first calendar quarter was 2016:Q1, at $5.0 billion. Now it seems like a new first-quarter CAT-loss trend is emerging, with three consecutive years of CAT claims of $5.0 billion or more. Net losses for non-cat claims also rose, by $5.6 billion, to $91.2 billion from $85.6 billion—up by 6.5 percent. 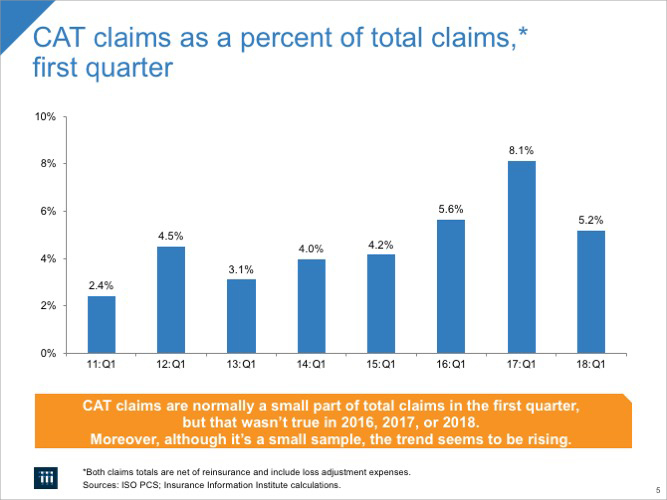 Another way to gauge the significance of CAT claims is as a percent of total claims, as shown in Figure 5. The 2018:Q1 percentage was 5.2. Reserve releases are generally associated with new estimates of expected costs for claims occurring in past years. Overall inflation continues to be remarkably low, likely contributing to these lower estimates, although prices for some items that comprise claims payouts have been increasing at higher rates. For the first quarter of 2018, the industry reported releases of prior year claims reserves totaling $7.4 billion, compared to releases of $5.5 billion 2017:Q1 and $4.4 billion in 2016:Q1. Reserve releases contribute to underwriting profit; reserve strengthening would subtract from it. On the other hand, expense growth, at 12.3 percent, was above even the strong net earned premium growth rate, and far above the overall rate of inflation. Obviously, faster-growing expenses cut into profit. Another widely used industry metric for gauging overall insurance operations is the combined ratio. This ratio is the sum of three percentages: losses and loss adjustment expenses as a percent of net earned premiums; policyholder dividends as a percent of net earned premiums; and other expenses as a percent of written premiums. In 2018:Q1 this ratio was 94.6, compared to 99.5 in 2017:Q1. Combined ratios for the major subsectors of the industry moved in the same direction, but to different degrees. For insurers writing predominantly personal lines, the combined ratio improved by 7.1 percentage points, to 94.2 percent. For those writing mainly commercial lines (excluding mortgage and financial guaranty insurers), the combined ratio improved by 1.4 percentage points to 94.0. And those writing balanced books of business posted a combined ratio of 97.2, 4.5 percentage points better than in the year-earlier quarter. 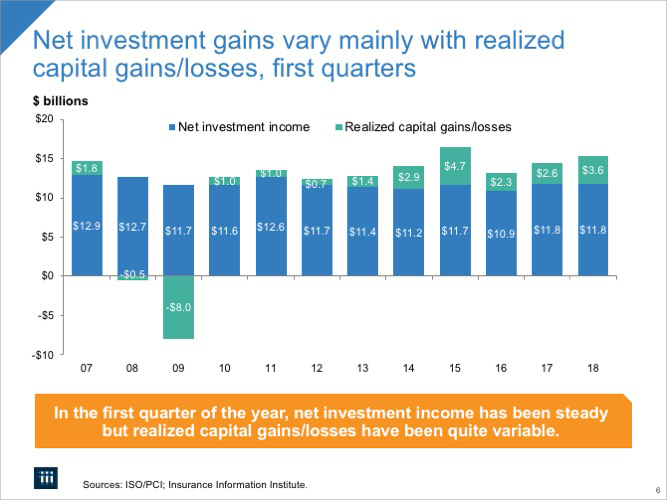 For the first quarter of 2018, net investment gains (which include net investment income plus realized capital gains and losses) were $15.4 billion, up $1.0 billion (up 6.7 percent) from 2017:Q1. This is almost a record; the $16.4 billion in net investment gains in 2015:Q1 was a record in this category for first calendar quarters, at least since 1986. In measuring insurance company net investment gains, accounting rules recognize two components: (i) net investment income; and (ii) realized capital gains or losses. Unrealized capital gains or losses are not considered income and affect only surplus on the balance sheet. Recent patterns in these two components are shown in Figure 6. Net investment income itself has basically two elements: interest payments from bonds, and dividends from stock. 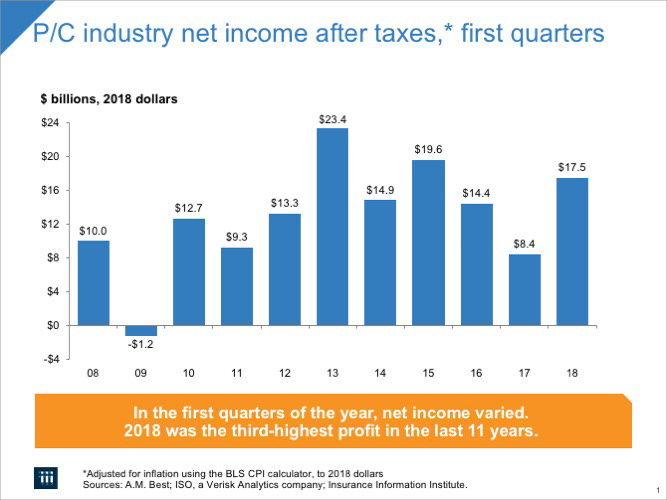 The industry’s net investment income for the first quarter of 2018 was $11.8 billion, the same as in 2017:Q1, which was up from $10.9 billion in 2016:Q1, and back to the $11.7 billion in the first quarter of 2015. Most of this income comes from the industry’s bond investments, which are mainly high-quality corporates and municipals. Corporate bond market yields in the first quarter of 2018, as captured by Moody’s AAA-rated seasoned bond index, rose through the first quarter, averaging 3.55 percent in January, 3.82 percent in February and 3.87 percent in March. Even so, these yields were slightly below comparable bond yields in the first quarter of 2017, which were 3.95, 3.92 and 4.01, in January through March, respectively. The yields in 2018 continued to shave income off the industry’s bond portfolio despite its growing size. This is because most bonds that are maturing now and being reinvested command lower yields than the bonds they replace. For example, 10-year AAA bonds bought in the first three months of 2008 averaged yields of 5.33, 5.53 and 5.51 percent, in January through March of that year. The other significant source of net investment income (besides bond yields) is stock dividends. Stock dividends have not risen as one might have expected, given the anticipated effects of the Tax Cuts and Jobs Act that became law in December 2017. Seasonally adjusted, net dividends in the first quarter of 2018 fell by 0.3 percent compared to the same quarter in 2017. Stock holdings in general represent roughly only about one-fifth of the industry’s invested assets. The other significant source of net investment gains is realized capital gains. The broad stock market, as measured by the S&P 500, gained 5.6 percent in January 2018, but lost 3.4 percent in February and lost another 2.7 percent in March, providing limited opportunity for cashing gains. As noted, bond yields generally rose throughout the quarter, driving marked-to-market bond asset values down, therefore offering few gains to be seized. The industry realized $3.6 billion in capital gains in 2018:Q1, compared to $2.3 billion in the first quarter of 2016. Policyholders’ surplus is the excess of assets over liabilities—what in other industries is called “net worth.” Both in dollar terms and in relation to insurance activity, it is a valuable indicator of the strength and capacity of the industry to handle the risk it has accepted. Policyholders’ surplus as of March 31, 2018 fell to $749.3 billion, down $3.2 billion from $752.5 billion at year-end 2017, but up by $40.3 billion from $709.0 billion at the end of the first quarter of 2017. Most of the drop in surplus in the first quarter compared to year-end 2017 could be attributed to $12.1 billion in unrealized capital losses. One commonly used measure of capital adequacy for insurers, the ratio of net premiums written to surplus, currently stands at 0.77, close to its strongest level in modern history. The bottom line is that the industry is extremely well capitalized and financially prepared, if necessary, to pay very large scale losses in 2018 and beyond. The property/casualty insurance industry turned in a profitable performance in the first quarter of 2018, buoyed by strong premium growth and aided by realized capital gains and reserve releases. Policyholders’ surplus remained near record levels. Fundamentally, the P/C insurance industry remains quite strong financially, with capital adequacy ratios remaining high relative to long-term historical averages. A detailed industry income statement for the first quarter of 2018 follows. **Includes mortgage and financial guaranty insurers.